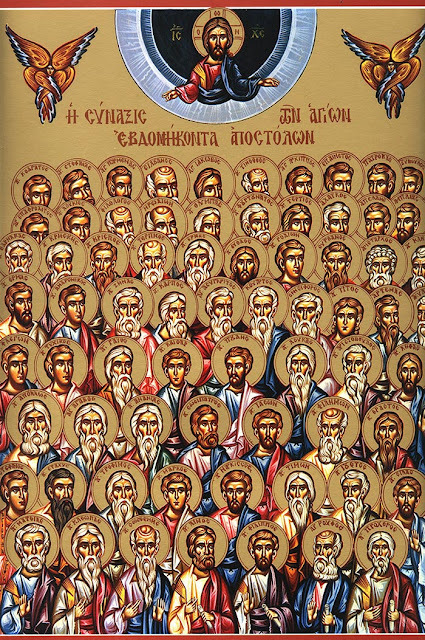 Image: Icon of the "Seventy Apostles." A new installment has been posted to the series on Eusebius of Caesarea’s The Ecclesiastical History: book 1, chapter 12 (Listen here). Eusebius here discusses the “Seventy” who were sent out by Jesus, as recorded in Luke 10:1-20 (see vv. 1, 17). Note: Eusebius is a witness for the traditional text reading of “seventy” (alongside Aleph, A, and W). Some modern translation, like the ESV and NIV, (following p75 and Vaticanus) read “seventy-two.” For my analysis of the text critical issues involved here, see this blog post. Eusebius says there are no extant lists of the seventy, but suggests they included Barnabas, Sosthenes, “Cephas” (though according to Clement, not the Cephas [Peter] of Galatians 2:11), Matthias (who replaced Judas), and Thaddeus. He then suggests Jesus has many other disciples, noting Paul’s reference to the more than five hundred brethren who saw the risen Jesus in 1 Corinthians 15:6. Of 1 Corinthians 15:7: “After that, he was seen of James; then of all the apostles.”, he takes James as a reference to “one of the alleged brethren of the Lord.” He also assumes there were “numberless apostles, on the model of the twelve.” Here he takes “apostle” broadly, as in Acts 14:4, 14 (Barnabas and Paul), 2 Corinthians 8:23 (Titus), and Philippians 2:25 (Epaphroditus). Later church traditions did, in fact provide a more extensive list of these disciples or apostles (see the Wikipedia article on “The Seventy Disciples”). The Vision (3.1.19): Behold the Man!